Home School Class - Wood Carving - 3 sessions- FULL - Land O' Lakes Area Artisans, Inc.
Eagle river wood carver, John Modjewski will teach children ages 7+ traditional wood carving. John Modjewski instructing wood carving. Tuesdays January 8, 15, & 22 1:00 – 3:00 p.m. each day. Kids ages 7+ $36.00 All materials supplied. Carver, John Modjewski of Eagle River will teach this class for beginners interested in wood carving. Using the simplest, yet an essential, carving tool – a bench knife, students will create arrows and ornaments. Students will learn safe carving methods; learn about tools, and about the different types of wood used for carving. John Modjewski, has been carving for well over 40 years. What began as a hobby has lasted a lifetime, starting with replicating a favorite crucifix belonging to his mother. 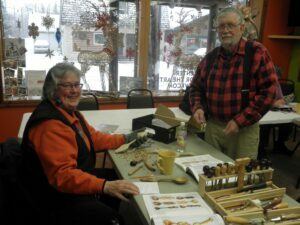 John is president of the Northwoods Carvers, a carving group that meets regularly in Eagle River. John’s love of carving has led to teaching others and sharing his talents. He has been an instructor at the Rhinelander School of the Arts, teaches carving workshops hosted by his carving associations and, as an active Boy Scout leader, has taught many boy scouts to carve.